Away from the cameras, NBA players hit half court shots all the time. They try them in practice, sometimes on a coach’s dare to try and end practice with a miraculous 47-footer, and they’re often successful. In public, though? With 20,000 fans watching and other stakes on the line? The shots don’t fall too often. Especially when you shoot them hook-style, instead of the typical two-handed approach. Drysch will get his $75,000, but he’ll also happily be forever known as the dude that LeBron James bear hugged in the middle of an NBA game. LBJ doesn’t typically bear hug Dwyane Wade, Chris Bosh, and especially not Chris Andersen. Michael Drysch, however, got the treatment. And deservedly so. Nice touch, sir. "Ecstatic. Euphoric. Wonderful," Drysch said. "I put some spin on it. A good night made even better. "That," James said, "was awesome." "That was awesome, man," James said. "I was excited for him. When he wound up like that, I was like, 'Oh no, there's no way.' And then when I saw it in the air, I was like, 'Oh, that's got a chance.' I was happy to be a part of that." And, as Wade pointed out, it was with no practice, no warmup. "You kind of get jealous," he said. "The place erupted. 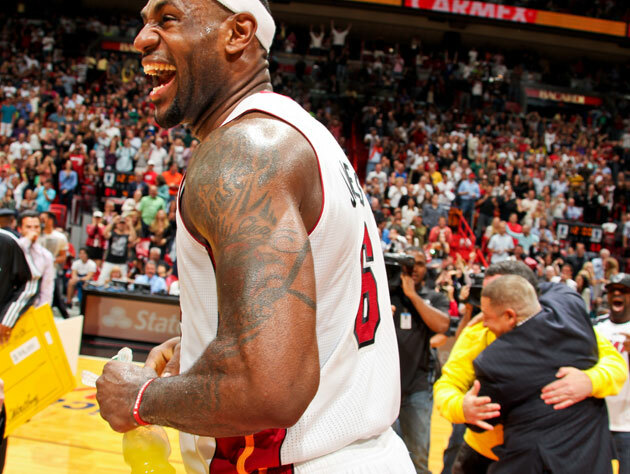 It was like when we won the Finals." Asked what James said amid their embrace, Drysch said, "He just said, 'It was a great shot.' Maybe I'll be an assistant coach/mascot." As for his earnings, he said it would go to paying bills and getting his car fixed. 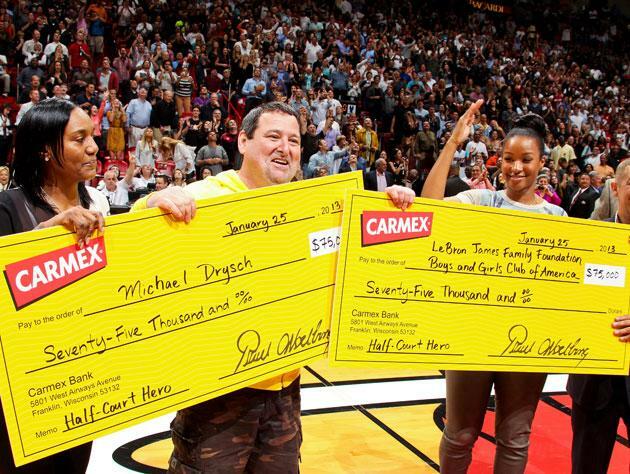 Also, on top of the $75,000 Drysch earned, Carmex (a lip balm company that is badly needed on the Illinois/Wisconsin border; perhaps not so much in South Beach) matched Drysch’s winnings with a $75,000 donation to the Boys & Girls Clubs of America – a foundation near and dear to LeBron James’ heart. Game in hand, hero in building, the Heat went on to outscore the Detroit Pistons by a 26-20 count in the fourth quarter to build towards a 110-88 win. James finished with 23 points, seven rebounds and seven assists in only 33 minutes, but he missed his only three-point attempt of the contest. Perhaps Michael Drysch can lend some guidance or tips to LeBron. He only charges $75,000 per session. • Are the 2012 Oakland A's sustainable?